The Results Roundtable with Bryan Dodge - Dodge Development, Inc.
Bryan’s New Educational Platform “The Results Roundtable” is Finally Here! Find Out How You Can Try it For Free! In this letter I plan to outline how you can stay motivated, build yourself from within, stay on top of your game, and have more success then you ever dreamed possible! Yes, it’s a little lengthy, but please read the whole thing, because I wanted to be as thorough as possible, and really express how much this program means to me. For the better part of a decade now I’ve been inundated with requests for personalized coaching and targeted programs that could provide a path to more fulfillment in life. Frankly it’s been hard to do, primarily because of the time commitment involved. However, as 2018 came along, I was determined to put together a platform that would be engaging and educational— something awesome, and life-changing! It’s tough to stay positive, on top of your game, not to mention making the effort to get ahead. Managing work life, with home life, maintaining a marital relationship, handling finances, and raising kids can all be overwhelming. The concept of being able to accelerate success in all areas of life, including communication skills, time management, dealing with stress, working as a team, leadership and financial matters, all in one easy to use format is exactly the goal I had in mind. Out of curiosity, what do you think a format like this would look like? Well, I’m pretty sure you’d want it to be easy to navigate, and on-target with content that matters to you as opposed to a bunch of double-speak. Matter of fact, you’d probably really like it, if you had an actual say in what was discussed, or at least a way to submit suggestions on topics you’re interested in! based on time constraints alone. The thing is, I’d have conversations with people at speaking engagements who really had an interest in some kind of coaching, or longer term education, but were just limited with what they could do financially. No one should be denied the ability to grow as a person because of money! That’s why I’m really pleased to finally be able to unveil The Results Roundtable! Take a look at some of the awesome benefits! 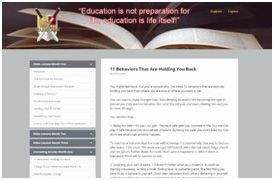 · It provides on-going education in not only business related matters, but also in developing a successful mindset. · It gives you the ability to ask me questions and interact through monthly Q and A webinars (or conference call). · It gives you access and networking ability with other members through a private “secret” facebook site that only members can access, or even find for that matter. 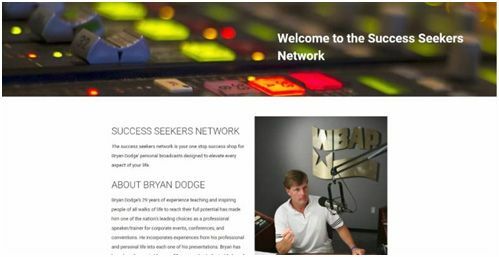 · It gives you access to the Success Seekers Network website where you can listen to and download my weekly broadcasts, get content descriptions and much more. 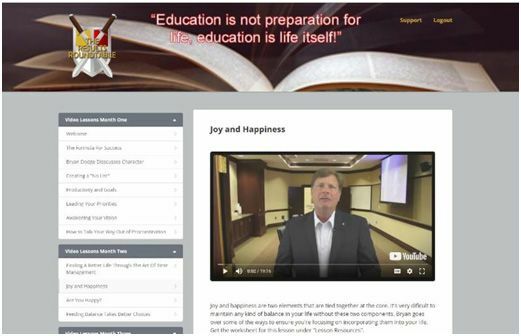 · It gives fresh, new lesson videos each week, all providing valuable insight and success-oriented applications. The audio is downloadable so you can listen anywhere you may be. · It gives you on-topic articles from experts in the monthly field of discussion. · Special guests that will be adding content in their area of expertise. Basically, you’ll get on-going coaching and a lot of the same benefits that executives get with my executive coaching plans! Plus, this is set up so that you can go at your own pace. New content is released every 30 days, but the previous month’s content is still there! Each month has a specific theme, and all content revolves around that theme. You’ll have access to each months’ content in an easy to use interface that divides it all up by sections. Content not available that month will be “grayed” out, and as the next month comes along, it becomes accessible. This “drip-down approach” makes it easy to know exactly what lessons are assigned to a particular month. The benefit to you is that you’ll know precisely what I’ll be asking you to do and it'll be in a very user friendly manner! This will all be geared towards helping you handle what you already have going on, and what you can do to take things to the next level! If you know my background, and many of you do, you’ll know what makes my approach different. People choose me to be their coach, or consultant because of the emphasis I place on fundamentals. I’m all about family, work life balance, goal setting, planning for the future and self-education! All you have to do is look at the results my consulting clients have gotten! Then picture a platform for individual coaching based on the same principles, and you've got a perfect description of what we’re doing here. Now granted, these are organizations we’re talking about here, but when I choose to work with an organization, it starts with the people in it, and that’s what we’re going to do here with The Results Roundtable. Picture yourself being able to go to one place, and get all the content you’ll need to improve your work/life balance, sharpen up and learn new leadership skills, set and actually accomplish your goals, and develop a mindset geared for success! That’s what this is all about, and why you need to be a part of this incredible opportunity! Where else will you be able to get so much life-changing information in one place? This is the solution you’ve been wanting in order to stay on top of your game. A private society of success-oriented people that are looking to make every year their best year ever! So I’m sure you’re probably wondering what’s involved in signing up, and how you can get started. And I’ll get to that in a second, but before I do, I want let you in on something really cool! I touched on it earlier but it’s worth another mention. As part of your membership, you’ll also have access to the Success Seekers Network, which is basically an internet broadcast, or podcast that I’ll be doing every week! You’ll be able to see the upcoming topics and have a summary of what will be discussed. Of course you’ll also be able to download the broadcast for replay as often as you want! There will be special guests, unique and interesting content, and topics of interest that you suggest, in either the Q & A webinar (or conference call), or from what you’ve shared interactively on the private members only facebook site. On top of that, we’ll be putting together an annual event that will be members only and packed with even more life - changing information. This will feature not only myself, but guest speakers that will be carefully hand-picked! So here’s what we’re going to do. As a special introductory offer, you can sign up today for a 14 day FREE trial of the Results Roundtable, no obligation, and no risk. You’ll get full access to everything we’ve talked about here for that 14 day period. If you cancel within the 14 day period, your card won't be charged a dime. If you stay with us, it's just $29.99 a month for as long as you stay a member. There’s no contract, and you can cancel anytime! That’s basically a dollar a day to have your own personal connection to everything you need to stay inspired and growing! That’s literally pocket change my friends! In today’s fast-paced, get it done yesterday environment, it’s so easy to get distracted and out of sync when it comes to balancing work and home life. Right now, 64% of married couples both work, and this is one of the main reasons todays marriages are so strained. Managing money in a two income family, raising kids, setting long-term, and short term goals, and just spending quality time with one another, can be a real challenge. Having a quality resource to help you stay focused on what matters, and how you can keep it all together is what we want to bring to the table. The Results Roundtable will be a private support system that will hopefully help you achieve life harmony, and as a result flourish as a person! Obviously if you just don't buy into it, or don't put much faith into the philosophy that "change comes from within", or that building a better person leads to a better life, then..... well, this might not be for you. then I don't think you'll find a better resource, especially for what amounts to pocket change per day! And now you get a chance to check it out for FREE!! There’s nothing to lose and everything to gain! Can investing a dollar a day improve your life? I say it can, and I want the opportunity to prove it! I look forward to seeing you, on the other side!